Need a gas appliance installation in Denver? The Gas Connection has been doing it for for over 38 years! Bring excitement to your back yard gatherings while enjoying the warmth and beauty of your own personal campfire at the turn of a key! No mess, cleanup or hassle. Optional electronic ignition can provide safety, convenience and provide control for designated individuals. General Fire pit Specifications. Gas grills are available in four models: roll cart, patio pedestal, in-ground post and “built-in.” Gas grills are more economical and safer than charcoal or propane. Never run out of fuel again! Make your outdoor gas appliance installation easier, more convenient and fun for everyone! Timers are also available for this product. Use your patio all year long! Patio heaters offer warmth to extend the life of your outdoor room. They come in a variety of models including umbrella, wall mounted and suspended units. Why not take advantage of all the landscaping you have done and enjoy your outdoor room! 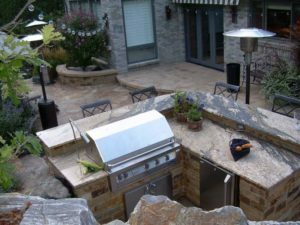 A pre-fab fire pit is an additional alternative when it comes to gas appliance installation, weight limitations or space are a concern. Although they do not have the flame or heat of a custom fire pit, they are very useful for decks or small patios. The soft, mellow glow of modern gas outdoor lighting is a charming way to add value and security to your home. In addition, bugs are not attracted to the light spectrum emitted by gas lights. They available in many models and styles for your yard, deck, patio and driveway! The newest idea in back yard entertainment. Wow your friends and neighbors with the beautiful lighting idea. Never use messy oils again! Choose from a variety of styles. Never be without power again. Styles and capacities to accommodate basic back up needs or fully automatic back up power for your entire house. Installing a natural gas swimming pool heater for your in-ground or above ground pool could extend your swimming season by several months.